Last updated 30 November 2018 . By Georgia Evans. 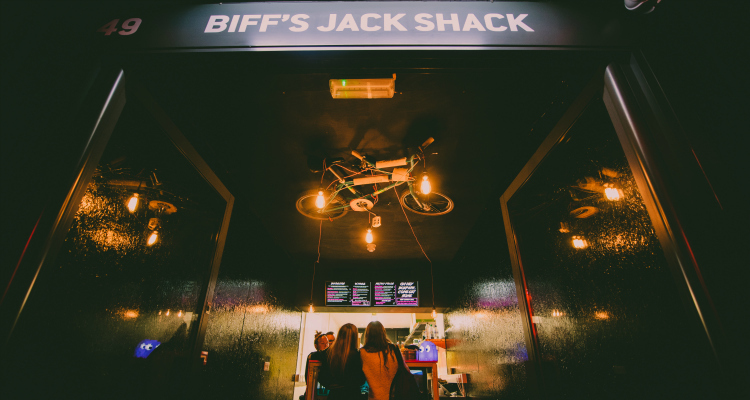 Biff's Jack Shack are hell-bent on creating filthy vegan junk food that's packed with flavour. Taking a weird spiky tropical fruit, double-dipping it in crumbs and frying it to create a meat-like substance, their jackfruit is totally unique and has been a hit at festivals and pop-ups, dispelling any myths that vegan means boring. So, when I heard they had a permanent home at the oh-so-trendy Boxpark in Shoreditch, I knew I had to check it out. The crowd was made up of young hipster types, with a DJ spinning Latino house music as we retreated from the cold to sit under the heaters. I started by tucking straight into the poutine (£6), made with faux cheese curds, porcini mushroom gravy, seitan bacon bits and toasted seeds. As someone who’s never had poutine, what a revelation. It was a perfect winter warmer, and even though gravy was dripping onto trousers as I attempted to share across the table, this stuff was worth the dry-cleaning bill. The Jack Bauer Tower of Power (£10) was up next. 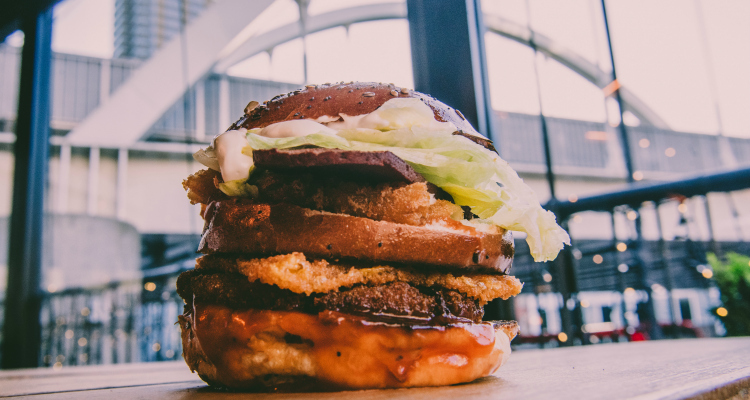 This beast of a burger contains garlic aioli, hash browns, deep fried cheese, lettuce, a crispy fried jackfruit patty and ketchup, all crammed in a double decker brioche bun. Grasping onto it with two hands, I took the first bite and was immediately covered in ketchup from my nose to my chin, yes, the burger is that big, and yes, my face is that small. Regardless, its delicate sweetness and smoky flavours were a real treat. Finally, the wings (£10 for four). If you’re a herbivore and haven’t tried Biff’s wings yet, do it now. The crispy deep fried crust contrasts perfectly with the soft tender fruit below, much like a classic chicken wing. The best part is that there are no bones involved, just a sugarcane running through. Sampling one of each flavour, The Bang had a delicately bitter spice to it, The Buff’s blue cheese gave it a gorgeous earthiness, The Burb was deliciously sweet and sticky, while The B’Ranch had a maple chipotle that provided a delightful smokiness. The term ‘filthy AF vegan junk food’ is one coined by Biff’s Jack Shack that seems totally befitting to what they’re doing. We’ll still venture on when there’s ketchup running down our faces, while we’re covered in gravy and haven’t even made a dent in the jackfruit wings yet. If you’re craving deliciously dirty fried junk food then Biff’s have got you covered whether you’re a vegan or not, just remember to pack some wet wipes. Biff's Jack Shack can be found at Boxpark Shoreditch, 2-10 Bethnal Green Road, E1 6GY.